Informative and willing to work with me on any issue. Family had a great time and will be back again. It has always been a pleasure to stop into the office and chat with the girls. They are efficient and responsive to our inquiries and know everything one is likely to ask about. And they remember who you are when you stop in. Our stay at Betty's Beach House was comfortable and had plenty of things to occupy anyone who stays there. Books, games, puzzles and a TV that is smarter than any of us were. As nice as it was to go out and experience the Beach and surrounding area, it was always pleasant to "come home" in the evening. 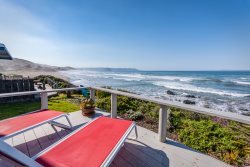 We hope it will be available the next time we come back to Cayucos, but if it isn't, we know we can depend on getting a nice place from Beachside Rentals. The members of your team were professional and kind. The property has a nice view and is only steps from the beach. It's also pet friendly, so it's nice to be able to bring dogs. Taylor was awesome very helpful and friendly. We have been to the same house for 11 years it is perfect for our family. Everyone I spoke with by phone or in person was friendly and outgoing. When there was a problem, they assured me that it would be taken care of in a timely manner. This is the second year I have rented this property. It is ideal for my family to rotate in and out. Plenty of room for all. The neighborhood is quiet which makes for a relaxing get-away. We had a great time. The beach access was perfect. Very easy to work with. They are friendly, welcoming and helpful. Making memories, from our son's graduation from CP SLO to our granddaughter speaking her first words like ocean, hat and fish! This property is the perfect fit for our family. We make full use of both patios during our stay. Love the new fire pit! The living & dining areas have beautiful views of the ocean, coastline, and breathtaking sunsets. Looking forward to our beach vacation in 2019!